Home » blog » Authentic Pashmina Shawls, a.k.a. Cashmere Shawls from The Kashmir Company! Authentic Pashmina Shawls, a.k.a. Cashmere Shawls from The Kashmir Company! So you’re looking for authentic Pashmina Shawls? But me telling you that you’re in the right place simply isn’t enough. There are too many online stores selling Pashmina Shawls that ARE NOT AUTHENTIC! And yet they claim you’re spending your money on the real deal. That’s why the Kashmir Company offers REAL hand-crafted Pashmina Shawls – imagined into being by 3rd, 4th, 5th and even 6th generation artisans. After all, Pashmina Shawl making isn’t something anyone can just pick up. It has to be in your blood to sit through years of tedious hand-sewing and embroidering to passionately complete just one shawl. The Pashmina Shawls you see here aren’t created by machines like the $75 garments you see on other websites. Seriously, do you honestly believe you could buy an authentic handmade Pashmina Shawls for pennies on the dollar? Our authentic Pashmina Shawls are the culmination of each individual artisan’s blood, sweat and tears poured into every piece you see on our website. These are as one-of-a-kind works of art as you can possibly imagine. However, I admit, there are tons of misconceptions about Pashmina Shawls and the true origin of their name. It’s indescribably important for me and The Kashmir Company that the full authenticity of all our shawls is fully communicated. Because when I talk about Pashminas, most consumers don’t understand I’m actually referring to what you might call Cashmere Shawls. Cashmere is one of the most misunderstood fabrics in all of fashion. The name cashmere is actually a derivative of the Kashmir region. And cashmere really isn’t even a fabric… it’s a marketing name used in the west. When people (and clothes makers) talk about Cashmere, there REALLY communicating they offer Pashmina Wool, an homage paid to the goats (of the same name) from the Kashmiri territory. Amazingly enough, this simple misconception came when Pashmina Shawls migrated to Europe and the U.K.
People called them Kashmir Shawls because of where they came from. The shawls sounded like cashmere, rather than Kashmir. …And here in the states, we’ve taken this pronunciation misstep to the umph-degree by calling every Pashmina Wool garment, cashmere… instead of what it really is. But for people in the know, Pashmina is synonymous with shawls. …They know a shawl isn’t just something you wear to a glamorous event; Pashmina Shawls really MAKE the memorable moments in your life carry with them so much more meaning. That’s the power of fashion… it can define the memories that you cherish! Each cashmere shawl is a testament to the undying human spirit; a form of art that can worn, enjoyed and remembered… forever. A woman wearing a Pashmina Shawl cannot be put into a box or duplicated; she is a unique expression of femininity and vibrancy. There’s a reason why machines have taken over the manufacturing of Pashmina or Cashmere Shawls. Each one-of-a-kind Pashmina Shawl takes a long time to make and is WAY more expensive than their mass-produced counterparts. …Kashmiri Artisans don’t spend their winters (before & after farming season) giving every spare second they have to painstakingly create these wondrous works of art for the sheer enjoyment of it. They do it because they’re poor and have a remarkable gift that can bring income to their families. Their passion for crafting shawls is just as much about grief and the undying desire for a better life as it is a means to an end. The Kashmir Company supports these brave and courageous artisans by broadcasting their genius to the world. And in the process, helping the farmers and families of the Kashmiri region receive more recognition for the spectacular gifts they’re sharing for the world to enjoy. The Pashmina Shawls we present at The Kashmir Company are reflections of the pain, love and hope that each person pours into every single stitch that makes your work of art! To Your Cherished Enjoyment of Authentic Shawls! P.S. I see a world where these authentic Pashmina Shawls are once again trend setters in the fashion world. And part of getting there is making sure people of all walks of life understand what they really are and where they come from. So when you browse our amazing collection of matchless shawls, I want you to imagine the stories that are a part of every handcrafted wrap you allow yourself to feel inspired by! P.P.S. 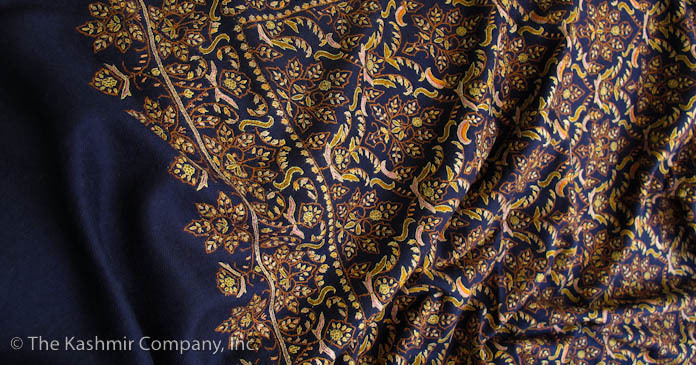 People who search for authentic Pashmina Shawls aren’t your average, run-of-the-mill shoppers. 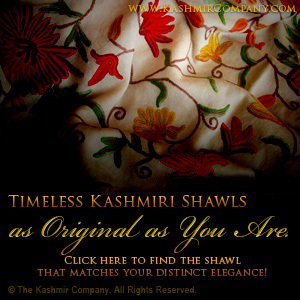 If you’ve typed Pashmina Shawls into Google and found yourself here at The Kashmir Company, you’re a true connoisseur of fine things. I know you’ll feel completely entranced by our spectacular selection and find that one shawl that calls your name! This entry was posted onWednesday, December 7th, 2011 at 3:23 am and is filed under blog, Shawls. You can follow any responses to this entry through the RSS 2.0 feed. You can leave a response, or trackback from your own site. You can skip to the end and leave a response. Pinging is currently not allowed. Only wanna comment that you have a very nice site, I like the style and design it really stands out. I’ve been browsing on-line more than 3 hours as of late, yet I never found any fascinating article like yours. It is beautiful worth enough for me. In my view, if all webmasters and bloggers made good content material as you probably did, the web can be a lot more useful than ever before.